UPDATE: Is Hanergy The Next Yingli Green Energy? Chinese thin-film solar manufacturer Hanergy Thin Film (566.Hong Kong) lost one-third of its market value this morning, for no apparent reason other than that it may have been overvalued for a long, long time. I sifted through reputable local Chinese media and found nothing damning on Hanergy this morning (Please let me know if you see anything!). Users on China’s microblog Weibosuggested that perhaps Yingli Green Energy‘s (YGE) 45% slump in the last two days have raised alarm bells on Hanergy? 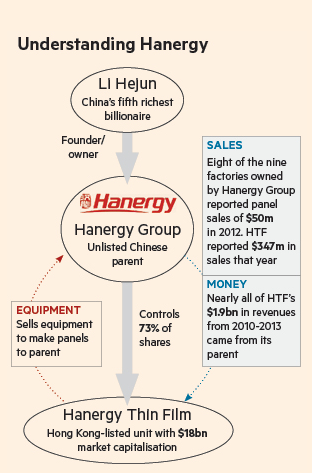 This blog has been raising doubts over Hanergy’s operating abilities for quite a while. For instance, on April 24 “Hanergy: Where Did All That Money Go? !“, I flagged an investigative report by reputable First Financial Daily on Hanergy’s opaque financing business; on April 14 “Hanergy: Thin-Film Technology Not Commercially Viable, Says Citi“, I questioned if Hanergy can make its thin-film technology scalable. On March 30, “Hanergy Profit Surges On Sales To Parent, Asset Disposal, But Chinese Love It Anyhow“, I worried that more than half of Hanergy’s business is to its own parent. And is there stock manipulation? “Is Hanergy’s Stock Manipulated? FT Investigates” (March 24). See also a solar bear’s take on Yingli’s problems: “Yingli’s Possible Bankruptcy: Not An Isolated Case, Says Wolfe Research“. If Hanergy turns out to be the next Yingli, the fall will be spectacular. Despite today’s slump, Hanergy has risen 348% in the last year. It is now the largest component stock of theGuggenheim Solar ETF (TAN). UPDATE: Hanergy was placed on a trading halt at 10.46AM Hong Kong time, after slumping 46.95%. Its shares were falling much faster than I could possibly write! UPDATE 2: Thanks Unemon 1 for the comment left on my blog. Unemon 1 asked us to look at this chart https://pbs.twimg.com/media/CFawruxW0AAT9mn.png:large. Hanergy’s annual general meeting starts at 10AM and the stocks started to sell off 15 minutes later. I heard unconfirmed speculation from traders that Hanergy’s chairman Li Hejun, who owns 80% of this stock, was not present at the general meeting. First Financial Daily just reported this. According to 21st Century Business Herald, a well-respected financial outlet in China, the six-month lock-up period for some employee shares expired this morning. But this explanation is also unconfirmed. Li Hejun, chairman and majority shareholder of Hanergy Thin Film Power, did not attend Wednesday’s annual meeting in Hong Kong. The FT has chronicled some curious trading patterns in the shares, but Wednesday’s move appears to be more self-explanatory. Mr Chow did not say where Mr Li might be, and Mr Li did not respond to request for comment. The Financial Times, in analysing recent financial statements of the company, has found some unconventional practices behind Hanergy Group’s soaring fortunes. It has been racking up enviable revenues largely through sales between its listed subsidiary, HTF, and itself. While many of its rivals have struggled to remain profitable, HTF, which sells equipment used to make solar panels, has reported net profit margins of over 50 per cent. It is now worth more than three times as much as its largest competitor, the US thin film solar panel company First Solar. In China, HTF is worth more than all other listed China solar companies combined.